CLEVELAND – The Ohio Craft Brewers Association presents the 13th Annual Winter Warmer Fest at Windows on the River on Saturday, March 9 from 2-5 p.m. More than 50 Ohio craft breweries will showcase their winter seasonal, limited-edition and high-gravity beers. 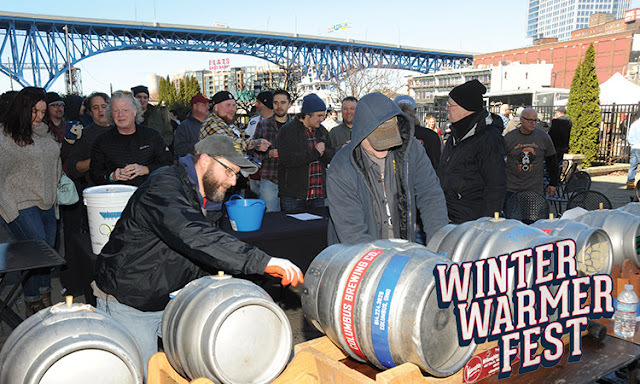 The Winter Warmer Fest is a fundraiser for the Ohio Craft Brewers Association, a non-profit organization founded to promote, preserve and protect Ohio’s craft brewing industry. Winter Warmer Fest tickets go on sale Friday, Nov. 23 at 7 a.m. A $10 discount will be applied to the first 100 early admission tickets sold on Black Friday. The Black Sheep Pipes & Drums will welcome guests to the venue, while Cleveland musicians Austin Walkin’ Cane and Chris Allen will entertain guests during the event. Food trucks on site include Slyman’s Tavern, Scott’s Fire and Ice and more to be announced. Winter Warmer Fest is supported by Frantz Ward and Mosaic Employee Benefits.